Recipes and ruminations from a greedy Greek boy. Always take your culture with you. Leaving Crete behind was a doddle for me. I was five and plane journeys are another adventure with disappointingly small windows. It was only as me and my younger brother grew older that we began to cling more and more to the scraps of Crete that were still within our grasp. Vital to our connection was, and still is the food. Our food. We were blessed with a fantastic cook in the shape of our mum and even more important was her own passion and skill for creating Greek dishes. Our weekly menu might include at least one well cooked Greek meal among the chips and potato waffles prevalent on English dinner plates. The smell of cinnamon in meat dishes and oregano sprinkled on for good measure. These are lingering memories that mingle with images of whole roasting trays lined with rows of stuffed peppers and bubbling pans of deep red lava dotted with meatball islands. Finishing every meal by casting aside the fork and tearing up crusty white bread to get every last drop of flavour off the plate. Every last drop of Crete. One of our family favourites is without doubt pastitsio (pass-teech-ee-oh). A dish of this lasted a couple of meals because of its size and in my opinion, the second sitting was always superior- the flavours had completely developed and the dish held itself together well. Mum reckons it’s best straight out of the oven, but I think that’s her English attitude towards food and I can’t convince her otherwise. 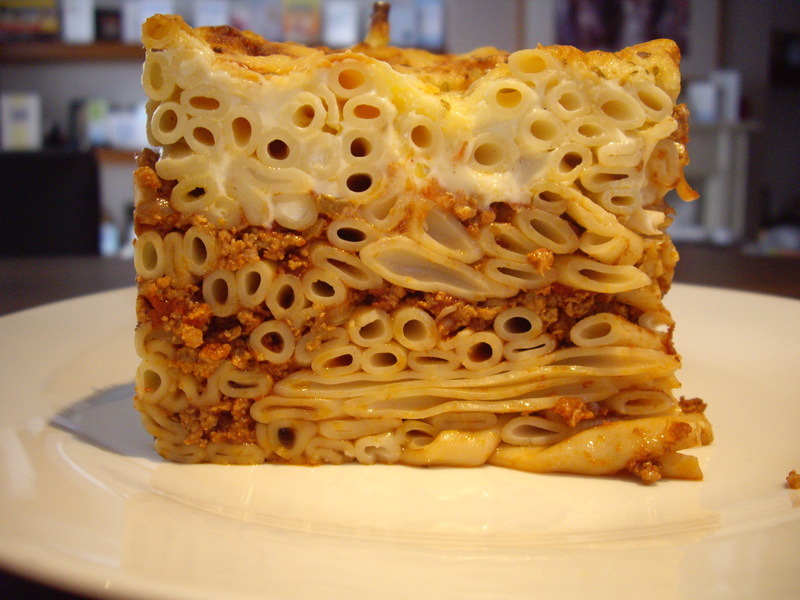 Essentially, pastitsio is a construction job that yields a satisfying outcome. I would love to demonstrate some sort of skill in preparation or dazzle with exotic ingredients that evoke rural Greece and its traditions. However, the ingredients are basic and the method couldn’t be simpler. I’ve adapted the recipe to suit my own taste and lifestyle. This is another way of saying that I season it just the way I like it and I use ingredients that will allow me to get in from work and still get it on the plate without major effort. The sauce must be thick. I always chop the onion and fry it with the mince to begin with. Before the meat is fully cooked, I add the cinnamon. Adding it at the start means that the flavour will carry through the whole dish. Too much cinnamon ruins everything so go easy. It’s a nice background flavour and nothing more. I also add the oregano and stir the beef thoroughly. 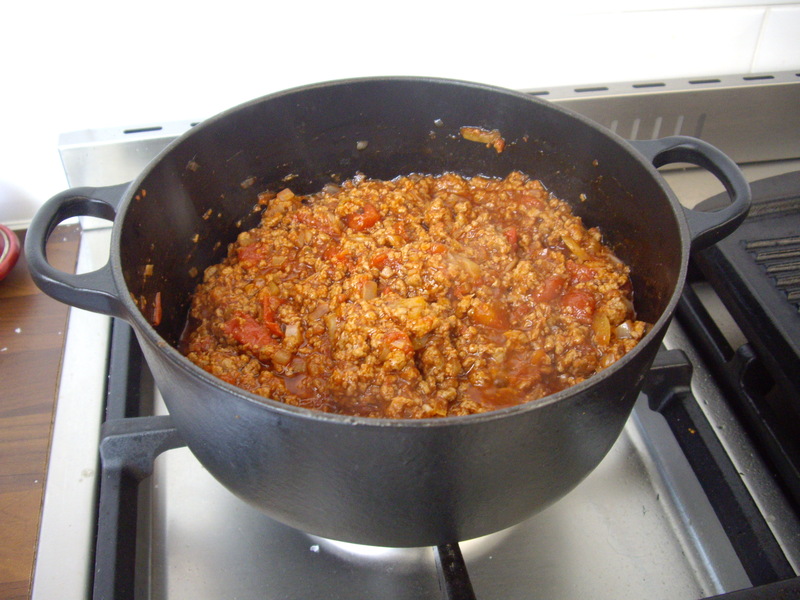 Once you’re happy that the mince is browned, add the tomatoes and gently simmer. Add the puree at the same time and stir through. Once it has reduced a little, add the wine. I tend to bring everything to a rapid boil to get rid of the alcohol and then reduce the heat after a couple of minutes and simmer. 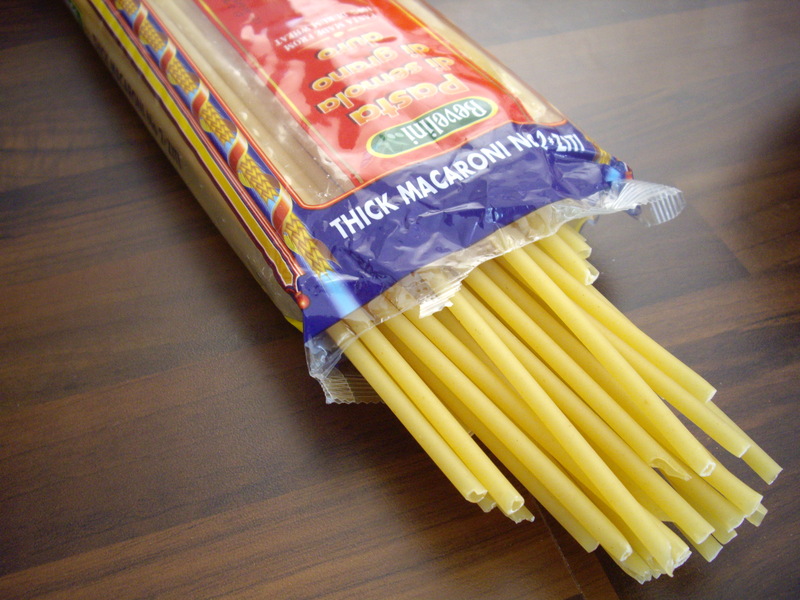 Tesco started selling this pasta last year. At this point, it’s a good idea to get the pasta going. If you can’t get the long macaroni in the photograph, do what my mum had to do for years- use penne. Cook it according to the packet instructions and set aside in water until needed. I season the meat sauce towards the end and keep tasting it. The sauce needs to be quite thick, but not dry. Once you’re happy with the sauce, it’s time to begin construction of the pastitsio. I begin with a layer of the macaroni and then alternate between that and the sauce. until I reach the top of whichever deep dish I’m using. Recently I’ve tended to use a circular ceramic dish because it’s the deepest thing I’ve got and pastitsio is a tower of awesomeness, not a flimsy lasagne. When you’re nearly at the top, use a final layer of macaroni and then pour on the cheat ingredient- white sauce from a jar. Some may tut in disgust, but it’s not very often that I make my own bechamel. If you want to, fill your boots. Grate or sprinkle the nutmeg onto the white sauce and then top with as much grated cheese is you can lay your hands on. The best thing here is that you don’t need to do anything else until you want to eat. This can be made in the morning and then put in the oven later that day. Middle shelf at 180 degrees is enough to heat this through. Obviously it will depend on how deep your dish is. Mine was large and needed a while. It is really important that you let the cheese melt and then go really brown and golden before removing it from the oven. You can always grill the cheese if it isn’t brown and crispy enough. My advice on serving is to eat it the next day. If you really can’t wait, then give the pastitsio time to cool so that it firms up. This will make it so much easier to cut and serve. This is key to making a good pastitsio. It should be able to stand on its own once cut. It’s filling, but serving it with a nice cabbage salad with oil and lemon really helps cut through the rich flavours. This is a slice of culture, memories and hearty nourishment. It’s great at any time of year too. Enjoy. Is it as good as mum's? 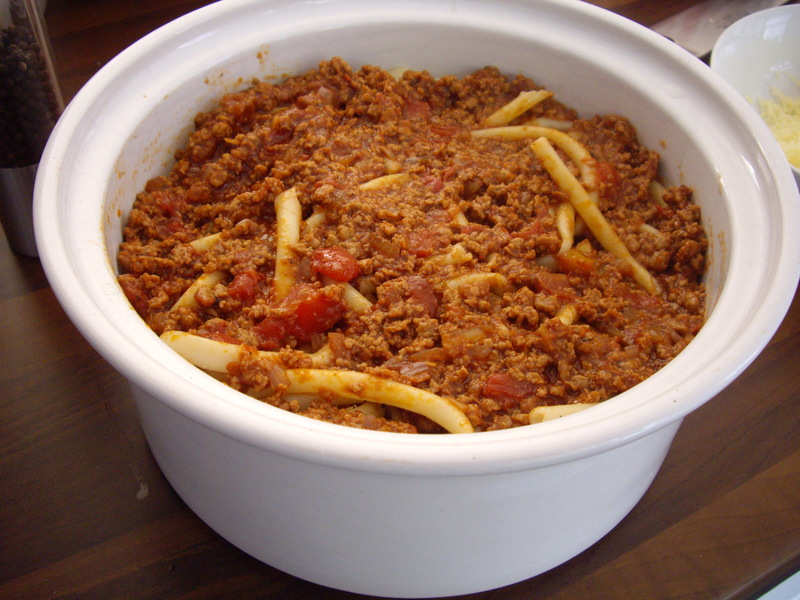 This entry was posted in Pastitsio and tagged Crete, Greece, mince, pasta by Dimitri @ The Last Piece of Cake. Bookmark the permalink. To choc or not to choc. Is that really a question?